As far as bosses go, the majority aren’t stellar. In fact, one study found that 87% of the employees surveyed have had a bad boss. So, are you one of those horrible bosses? You probably aren’t or you wouldn’t be reading ResourcefulManager, but there’s a good chance you do have a few bad management traits that could be improved. For example, maybe you’re like me and a little bit of a control freak. That’s not necessarily a bad thing, if you know how to rein it in and not drive everyone you supervise up the wall. Good bosses admit their mistakes and learn from them. Bosses who blame their teams for failures and take no responsibility for them are the lowest of the low. These people, however, are often all too happy to take credit for their teams’ successes. There are those managers who refuse to apologize for anything because they believe it’s a sign of weakness and causes staff to question their authority. Apologizing for an error helps build respect and trust within the staff. When employees see you apologize for an error, it reinforces that they work in an environment of trust and honesty. Early in my career, I had a boss who would get his staff to do all his work by telling us he was working on a special project. He lied like a rug. He was busy listening to his favorite political talk show every afternoon and scheduling gigs for his band. I know this because I had the office next to his! Needless to say I wasn’t the least bit sad when he was fired! Bosses should be role models for their employees and work just as hard as their staffs. How can you manage people if you don’t know exactly what they do? Good managers take an interest in their employees and their jobs, and are there to pitch in when there’s an emergency. If you love office drama, you’re a bad boss. If you’re the cause of the drama, you’re one of those really horrible bosses! No office is drama free. But as a manager your job is to step in and handle it when it’s disturbing your team, not be the cause of it. Managers who work around the clock and expect their employees to be at their beck and call even when they’re not on the clock are typically disliked … a lot! Good managers respect their employees’ personal time, and realize they have a life outside the office. Some people revel in the misery of others and these people make horrible bosses. Supervisors should want to see their employees happy, because happy workers are productive workers. Miserable employees focus on their misery and how much they despise their boss, which takes their attention away from work. Bad bosses know the goals and vision of the company, but don’t relay them to their team. They provide no guidance, and just assume their team will eventually figure it out on their own. Maybe it’s because they don’t feel like taking the time to explain something or it’ll give them an excuse to blame their team when things go wrong. No matter the reason, it’s counterproductive. Employees who respect their managers don’t mind going the extra mile for them. And they don’t require major compensation for it. Sometimes a simple thank you is all that’s needed. However, just like there are managers who won’t apologize, there are also those who never say thank you. Not recognizing employees for things they do to help you out by simply saying thank you puts you at the front of the crummy boss line. Saying those two little words takes very little effort, but gives you a big pay out when it comes to respect and likeability. A sure sign of a bad boss – constant turnover. I bet you’ve heard the saying, “people don’t leave companies; they leave managers.” That’s very true. Bad managers have the HR/recruiting department on speed dial, because people don’t like to work for them. Guess what? When teams aren’t doing well it’s typically not their fault. Because bad managers and their poor management skills rub off on their team. Employees need goals and direction, and if they aren’t getting it from the appropriate source, they’re not going to do well. Know any bad managers? How many allies do they have at the company? Very often people who stink at management find themselves alone because other “good” managers don’t want to be associated with them. Their own staff even starts to ignore them because they lose respect for them. Being a “good” boss isn’t easy. It takes many different skills, and there’s always something that can be improved. But if you treat your employees fairly, consistently and with respect, you’re probably doing just fine. This is a mega-list of 33 things you should avoid as a manager. Not sure how you’re doing? 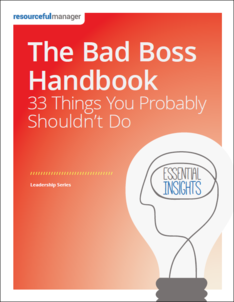 Then check out our Bad Boss Handbook.